My first three books are set in a small Michigan town called Starvation Lake. There is no such place. My parents bought a cottage in northern lower Michigan in 1971. The four-bedroom house sat on a green bluff overlooking Big Twin Lake. Big Twin wasn’t all that big—a snail-shaped lake about a mile long and a half-mile wide—but its deepest spots plunged to 110 feet and you could see sucker trout cruising the sandy bottom at 20 feet. Summer sunsets streaked the water’s blue-green surface with orange and purple reflections of backlit cumulus. My two brothers and three sisters spent a lot of time on Big Twin as we grew up and started our own families. As much as I loved summers on the lake, I took a liking to visiting in winter, alone. I would build a fire in the morning and read and write into the late afternoon, when I’d walk the lake’s three-mile diameter. Once the crows retired for the day, all I could hear was the crunch of my boots on the snow. Other times I’d take drives to nearby Kalkaska and Mancelona, skimming past the skeletal trees and mobile homes with smoke curling from makeshift chimneys. I might stop for a beer at one of the towns’ greasy taverns and watch the regulars sitting at the bar, alone, nursing Miller Lites and watching soap operas on muted TVs. I didn’t know that I was preparing to write the stories that would make up the Starvation Lake trilogy. My first novel had its start during a phone call with my agent in 2001. She had read 25,000 crappy words of a story that looked nothing like what I would later write. Knowing that I play ice hockey, she said, “Why don’t you write me a book about these middle-aged guys who play hockey in the middle of the night?” I immediately had an idea she liked. We turned to possible settings. I suggested the gritty steel town of Trenton just south of Detroit, where I had played some hockey as a kid, or a small burg in northern Michigan. That choice was easy. I knew the fictional town of Starvation Lake better than the actual Trenton (although Trenton and its downriver neighbor, Melvindale, played roles in all the novels). I stole the name of protagonist Gus Carpenter’s hometown from a lake three miles north of Big Twin. There’s no town on the real Starvation Lake, unless you count the general store and the Hide-A-Way Bar and Grill. I have always loved the name for its evocation of death and darkness, the opposite of names like Crystal and Paradise so often attached to pretty bodies of water. My made-up town was constructed of images, sounds, smells, and tastes I’d collected on my years of going “up north,” as we say in Michigan. For Main Street in Starvation Lake, I adopted M-88 as it runs through downtown Bellaire, about 20 miles north of Big Twin. If you stand on that street with the defunct movie theater on your left and Short’s Brewing Company your right, you are seeing downtown Starvation Lake as Gus does. On the left is his newspaper, the Pine County Pilot, in place of the long-gone Antrim County News, where I worked as a summer intern in 1978. Across the street is Enright’s Tavern, named after one of my high school hockey coaches. Minor characters Elvis Bontrager and Floyd Kepsel are named for homebuilders who worked up north. Ladensack Road is the namesake of the man my parents bought our cottage from. The Pilot newsroom is an amalgam of the Antrim County News and the home of my first full-time newspaper job, the Brighton Argus. Details that I hope bring the town to life—the click of melting ice in rain gutters, the jangling bells on the door at Audrey’s Diner, the smell of pot roast cooking at Bea Carpenter’s little yellow house, the tree where Gracie McBride is found hanging—all bubbled up from my well of observed memories. The central mystery in the first book sprang from a dream I’d had of a snowmobile washing up on the frozen shore of Big Twin. Write what you know, the saying goes. Some readers asked if the books were autobiographical, and I told them in all honesty, no. I’d never had a coach remotely like Jack Blackburn, never had a cousin found dead in a tree filled with shoes, never was related to a murdered nun. Unlike me, Gus Carpenter is short, balding, single, childless, a goaltender, and a disgraced journalist (as of this writing, I am not yet disgraced, as far as I know). I joked about how big my sales would be if the books actually were memoirs. James Frey would have nothing on me. I was finishing book three, The Skeleton Box, in the summer of 2011 when the truth of the matter dawned on me. I had not plotted the books out much beforehand, hadn’t imagined at the start that I’d write more than one story set in Gus’s hometown. But here I was finishing what I now realized was the final arc in a trilogy that at its core is about the relationship between Gus and his mother, Bea. My own mother, who started encouraging me to write when I was in second grade, died before my first novel was published. Once, at one of my readings, a friend asked what I thought my Mom would have thought of my books. I stammered in reply. The best I could come up with is that she would have deplored the bad language the characters use. Perhaps I didn’t want to admit how autobiographical the books are, how Gus and Bea’s fraught but loving relationship mirrored the one between my mother and myself, how we kept things from each other, how we deflected the truth of certain family matters so that we could just keep going, how we both loved Big Twin Lake. Today I would tell my friend that my mom would certainly have been proud of me, while recognizing some of herself in Bea, and wondering how the two of us had fallen short in our efforts to communicate through the noise of our family. Writing these words, I’m reminded of Mom on her hands and knees in her garden up north, whistling as she weeded, as happy as she could be. It makes me think Bea Carpenter may have been the realest single thing in the fictional world I created with my head and my fingers but that came, inevitably, from my heart. My publisher offered me a contract for two more Starvation Lake books. I sketched an idea for a story that would have taken place a decade after the last novel ended, with Gus married to the elusive Darlene and the town prosperous with natural gas fracking. My heart wasn’t in it, though; Gus’s story felt complete. I declined the offer and embarked on something new. After my father died in 2011, the cottage on Big Twin Lake became the property of my siblings and me. We held onto it until the realities of taxes, upkeep, and distance compelled us to sell at the end of 2015. One of my brothers lives in another house on the lake, so I still visit, although not in winter, when the place truly came alive in my imagination. Starvation Lake lives there still, glistening white with mystery and danger. Bryan Gruley is the Edgar-nominated author of the Starvation Lake trilogy of novels and a reporter for Bloomberg Businessweek magazine. He is at work on his fourth novel. The place I call home, a lot of other people call “the great flyover.” Mostly they’re folks who live on the East Coast or West Coast and have never set foot on an acre of ground in the center of America. To them, Minnesota is as alien as a crater on the moon. And probably, in their thinking, no less desolate. I spent my formative years in the Midwest, some of the most important and happiest years of my life. In my teens, I left but returned at age thirty and found the heartland a place that still spoke to me powerfully. It’s a land of four distinct seasons, each as different from the others as left is from right or up from down. Each has a unique beauty that, if it weren’t a part of the natural yearly cycle, I would miss terribly. I would miss coming over a rise on a summer night and seeing the valley below filled with fireflies so numerous it’s like looking at a lighted city. I would miss the way the leaves in October color a riverbank like a blaze of wildfire. I would miss the sound of new snow crunching underfoot when the temperature has plummeted to ten below. And I would miss that day when the sun finally arcs well above the trees and the last of the snow has melted and the first iris shoot curls green out of black mud and I understand perfectly why ancient people held delirious celebrations to welcome spring. I write mysteries, yes, but more importantly, I write mysteries about a place I love. I spend a lot of time concocting plots that I hope will keep readers guessing and on the edge of their seats, but in a way, the plot is mostly a vehicle to talk about Minnesota and the people who live here. We are German and Finn and Swede and Irish, many of us who are white. We are Anishinaabe, Dakota, Lakota and Nakota, most of us who are Native. Sometimes we mix well. Sometimes not so much, and it’s often out of this clash of cultures that my stories rise. I find it amusing that I get notes from readers who see the Upper Midwest as exotic territory and who have skewed notions of what life must be like here. I remember a phone conversation I had with my first editor in New York City. He was a wonderful guy, very bright, but I swear he’d never been west of the Hudson River. During our conversation, he asked me, “Have you ever had a moose wander into your yard?” Now, for those of you who don’t know St. Paul, it’s part of the Twin Cities—Minneapolis on one side of the Mississippi River and my town on the other. It’s a metropolitan area of almost three million people. This was my response: “No, Dave, the wolves keep them away.” He didn’t get the humor. When I teach writing, I try to make my students understand that at the heart of all great stories is great conflict. That’s one of the things I appreciate about Minnesota. Especially when I look up north, all I see is conflict. Conflict in the land itself, a territory of vast forests, fast rivers, deep lakes, and towering, rugged outcroppings composed of some of the oldest exposed rock on earth. Conflict in the weather, particularly our famed winters that can, in truth, kill the unwary. Conflict in this whole swirl of cultures—Finns and Swedes who came to cut the trees, Welsh and Germans and Italians and Slavs who came to dig the ore from the great iron ranges; and of course, the Ojibwe who’d been here long before the whites intruded, and who had, themselves, driven out the Dakota and Lakota who’d occupied the land before them. I have no trouble coming up with ideas for my Cork O’Connor mysteries. I’m not alone in this. One of the questions I’m often asked is why are there so many fine crime writers at work in my neck of the woods. For those of you who may be unfamiliar with Minnesota’s mystery output, here are the names of just a few of our multiple-award-winning, national best-selling authors: John Sanford, Tami Hoag, Vince Flynn, Ellen Hart, David Housewright, Erin Hart, Brian Freeman, Pete Hauptman, Mary Logue, Jess Lourey, Chuck Logan, Monica Ferris, Jessie Chandler, Laura Childs. I could easily fill a page or two, but you get the idea. In this area so often deemed pejoratively “the great flyover,” there’s a lot of fine, creative work being done. Okay, I’m going to get literary for just a moment. 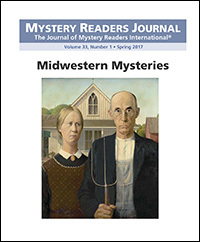 I believe a case can be made that there is a Midwest voice in literature, and those of us who write crime fiction are a part of it. The language in Midwestern literature tends to be spare but eloquent, and the stories often rise from an appreciation of our relationship with the land we occupy and from an understanding that, although we pride ourselves on shaping this land to our purpose, the land has, in turn, shaped us. Some of my favorite pieces of fiction have come from the pens of other broadly Midwest writers, Marilyn Robinson, for example, and Jane Smiley, and several other Kents—Kent Haruf, Kent Meyers, and Kent Nerburn. If some of these names are unfamiliar to you, I can’t urge you strongly enough to give their work a try, and soon. One final point I want to make about the proliferation of fine writing, mystery and otherwise, that has come out of Minnesota. It’s something that most readers, even many here in my adopted home state, don’t realize. The people of Minnesota decided long ago that the arts are important to the culture here, and they’ve stepped up to the plate in admirable ways. Support for artists in every venue is significant. In my own artistic development, I benefitted greatly from financial grants given both by the state of Minnesota and by local, private philanthropic foundations. What a magnificent spur to creative when the message you’re given time and again as an artist is that your work is valued. When I sit on panels at conferences, mystery or otherwise, one of the most common questions I’m asked is this: Could I set my stories somewhere else? My answer: Absolutely not. They wouldn’t be my stories, because my stories are all about home. William Kent Krueger is the author of the Cork O’Connor mystery series, set in Minnesota’s great Northwoods. His novel Ordinary Grace received the 2014 Edgar Award for Best Novel. He does all his writing in funky St. Paul coffee shops. I say the word “Midwest,” and the first thing you say is… what? I’ll bet the first word that came to nobody’s mind was “exotic,” and yet I believe it was that quality that won a Midwestern book of mine an Edgar nomination in 2007. I’ll explain that in a moment, but first I want to go back to the early 1980s when many of us were entering the mystery field. I observed at the time that no other writer was setting mysteries in the Midwest. (A terrible reason not to do it! And not even true!) And I thought nobody was doing it because no editor in New York City was just dying to read a mystery set in, say, Iowa. I would tell people that and they would laugh in a knowing way that confirmed my (wrong) opinion. The proof that it wasn’t true lay in a first mystery by the title of The Cooking School Murders that was set in a little town in… Iowa. It was written by Virginia Rich, who went on to set all sorts of precedents, including writing the first culinary mystery series, and doing intense self-promotion before Sisters In Crime was even a gleam in Sara Paretsky’s eye. (Well, there may have been a gleam. Sara is very far-seeing.) Rich’s first book and the next two in her series went on to be very popular, and so the imaginary stricture against Midwestern mysteries died on the corn stalk. Which brings us to my first standalone novel, The Virgin of Small Plains, set in the (sometimes not so great) state of Kansas. When I received the list of the six books that were nominated for the Edgar for Best Novel that year, I looked at it and immediately, thought, “What the heck?” Let me list for you the settings of those books: Istanbul (the winner), Istanbul (yes, two of them), England, Ireland, Eastern Europe, and… Kansas. What in the world was it doing there with Istanbul, Istanbul, England, Ireland and a fictional country in Eastern Europe? And why was there only one American setting on the list for an award given by an American writers’ organization? This all seemed really weird to me. I hesitated to look the gift horse in its mouth, but I just had to figure it out. Then I recalled what it’s like to be a judge for a literary award. I’d served on several of them, including for the Edgars. I’d read and viewed for Best Paperback Original, Best Film, Best True Crime, and Best Young Adult. I knew what happened to judges who read book after book after book, twenty, thirty, sixty, ninety books, up to the three to four hundred books that the committee for Best Novel has to read. They get bored, that’s what happens to them. Even with really, really good mysteries, they get bored because eventually all those perfectly excellent novels (along with the perfectly awful ones) began to blend together, causing their brains to glaze over. One private eye after another. One amateur sleuth after another. One cop after another. And here’s the kicker… one big American city or cozy coastal town after another, almost all of them set on the peripheries of this country, because even though you could get a Midwestern book published by that time, there still weren’t many of them, and most of those were still set in, say Chicago, Detroit, or some other big city. Rural Midwest? Not so common. I’ve never researched this, but I’ll wager mine was the only mystery novel that year that was set on a ranch in the Flint Hills. So. Picture the judge who is reading several UPS trucks’ worth of mystery novels that are turning to porridge in his mind. Suddenly up pops Istanbul. It feels different. It is different. The people may be dressed different, talk different, eat foods that McDonald’s doesn’t serve (yet), and even commit murders and solve them in ways that feel wonderfully fresh to the judge simply by virtue of being… different. Historical novels can have the same effect, I believe, because they, too, pop up out of the pile with their differences.The Istanbulian winner that year was a double threat by also being a historical. Viewed from that perspective, it no longer seemed weird to me that a novel set in ranching Kansas might end up on a list with two Istanbuls, Ireland, England, and a fictional city in Eastern Europe. When I type that, I can’t help but laugh because, seriously, it’s funny. Nancy Pickard has been an Edgar finalist four times: once for a short story and three times for novels: I.O.U., The Whole Truth, and The Virgin of Small Plains. Now that she thinks about it, that short story was set in Kansas and a few scenes from The Whole Truth were, too. Draw from that whatever conclusions you will.